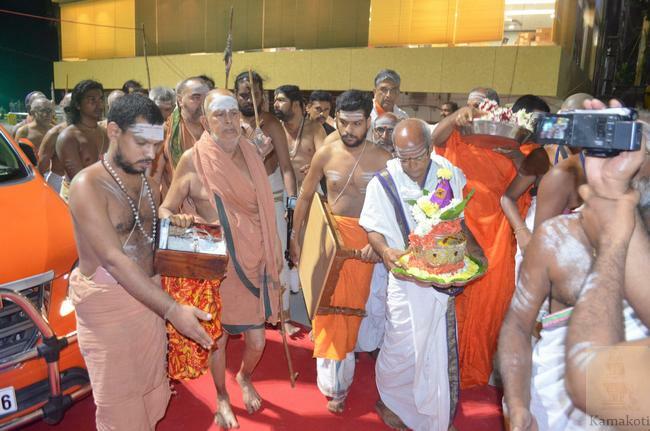 His Holiness Pujya Shri Jayendra Saraswathi Shankaracharya Swamigal & His Holiness Pujya Shri Shankara Vijayendra Saraswathi Shankaracharya Swamigal graced Krishna Pushkaram today in the early hours of the day. 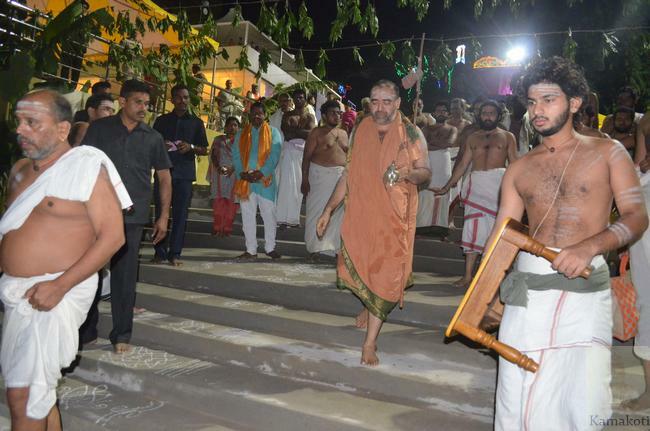 Pujyashri Acharyas were received at the Durga Ghat by Vedic Scholars, Sthanacharya of Kanakadurga Temple, Shri JSV Prasad - Principal Secretary of Endowments, Smt Anuradha - Commissioner of Endowments & other officials. 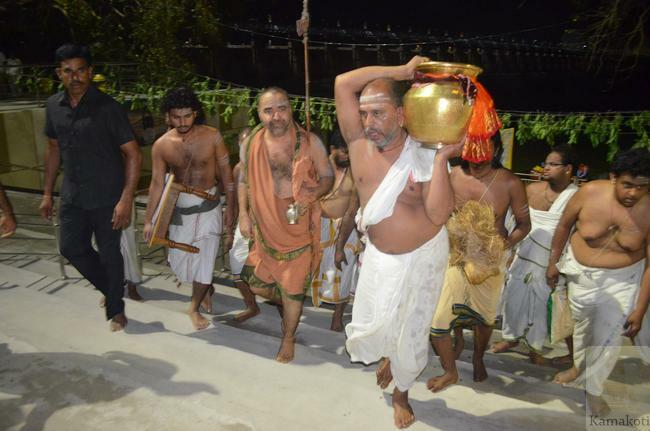 As a prelude to the Pushkaram event Chief Minister of Andhra Pradesh had sought darshan of Kanchi Acharyas yesterday at Srimatam camp and invited them personally to bless the Krishna Pushkarams rituals. 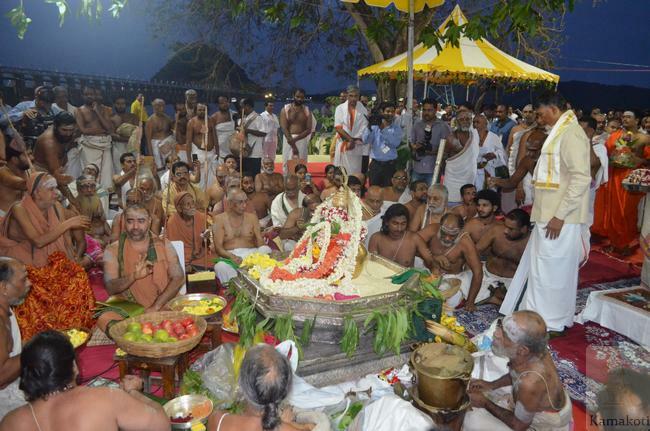 Mangala Vadyam denoted the commencement of the auspicious hour. His Holiness went to the banks of the river and collected Krishna Nadi Teertha in Kalasha and performed Kalasha Puja. 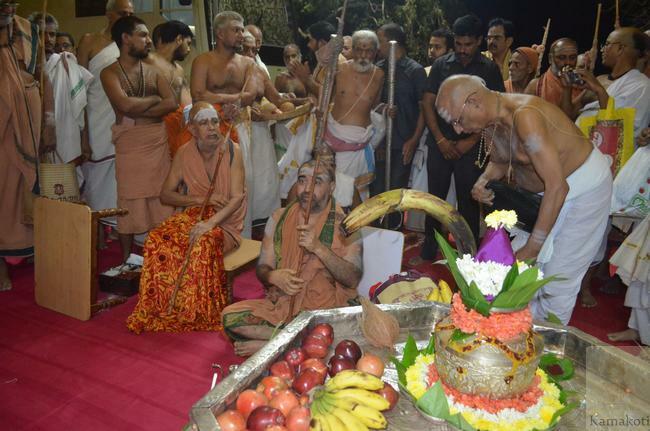 After Vinayaka Puja, Dhyana, Avahanadi Shodashoparacha Puja was performed to the Kalasha. 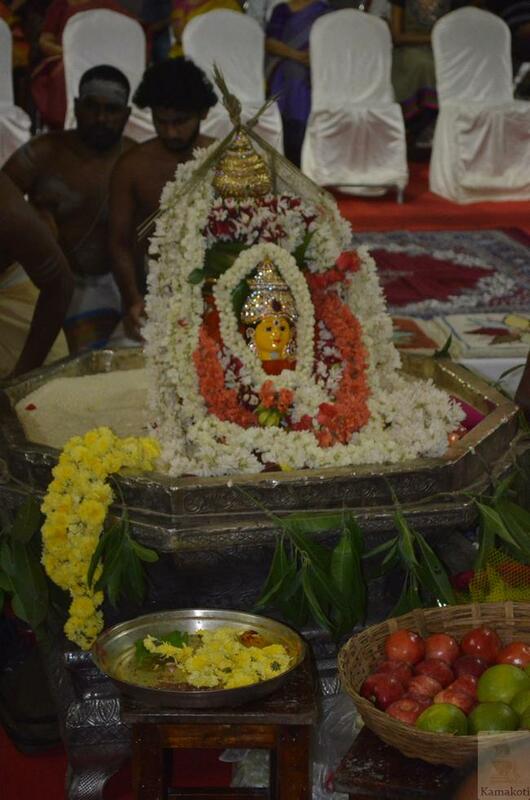 Being a Shravana Masa Shukravara, the Alankaras for Kalasha were accordingly decked with flower garlands, mango leaves & Varalakshmi Ammavari Mukha. Bruhaspati, Pushkara & Krishna Veni Namavali archana were recited. 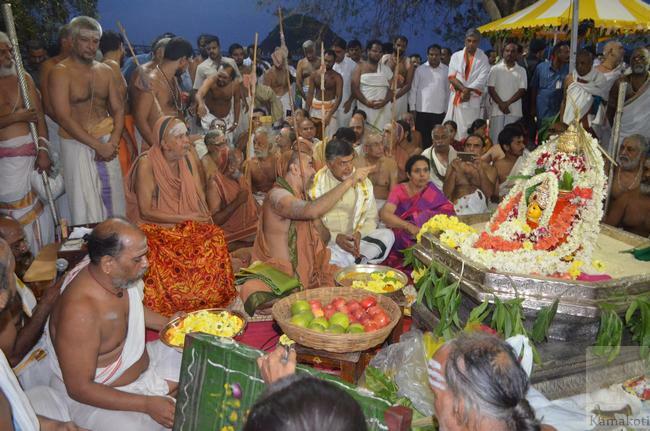 Special Sankalpa praying for welfare of one & all was read & repeated by the assembled devotees. 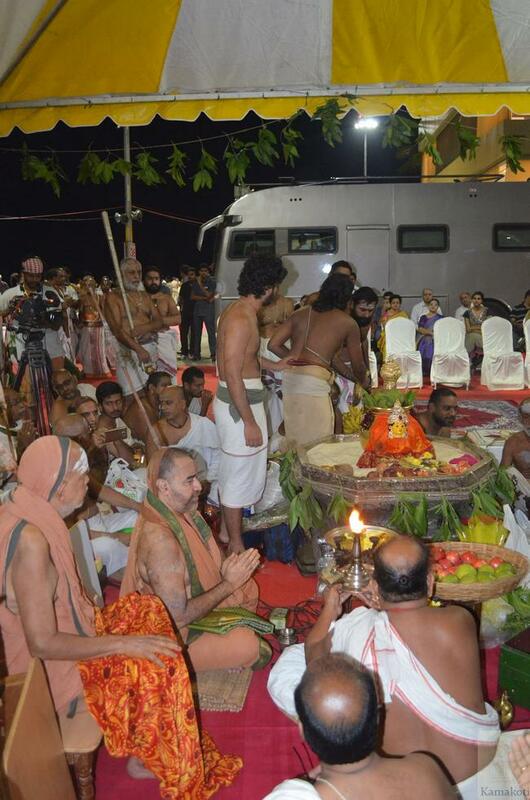 Harathi to the Kalasha was performed. 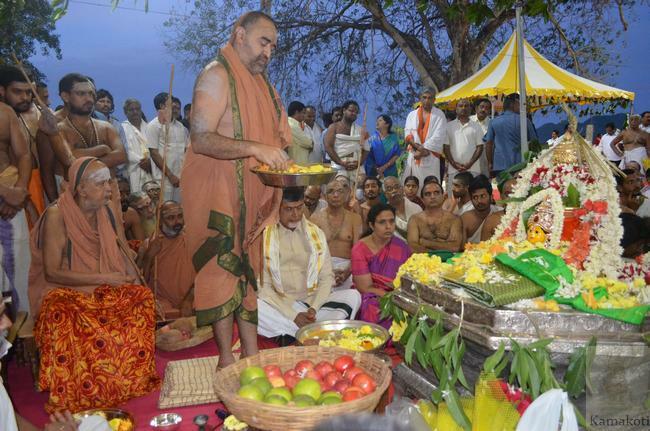 His Holiness then went to the banks of the river with the Kalasha Teertha and poured the Teertha into the Krishna river signifying the beginning of Pushkaram and followed it with Snana. 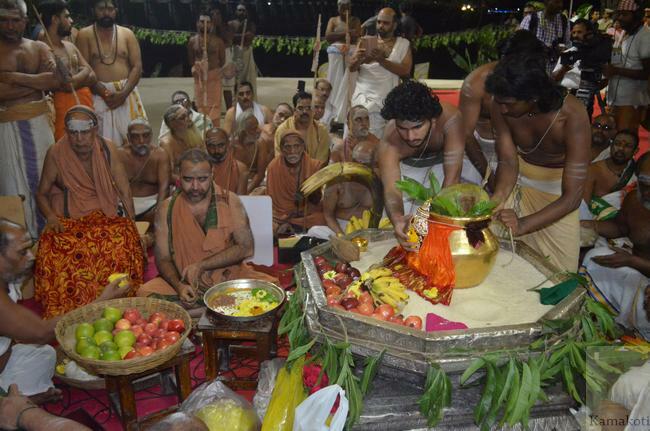 The Snanam was performed at 5.50 am during Udaya Vela. Dhyana, Snana & Arghya shlokas related with Krishna Nadi were chanted. 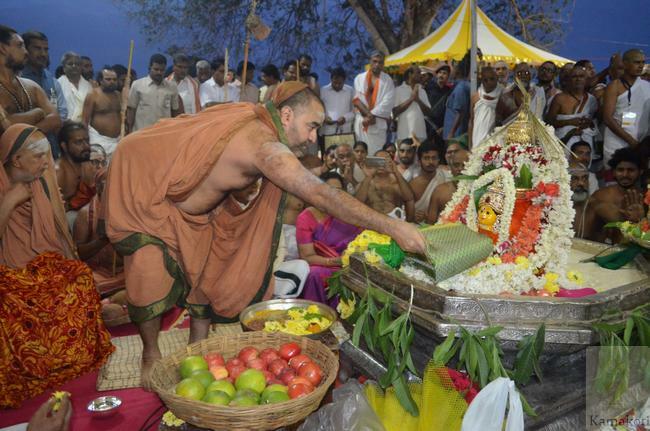 Along with Mangala Vadyam, Gauri Kalam from Srimatam- was blown during Harathi & Snana indicating the auspiciousness of the event. 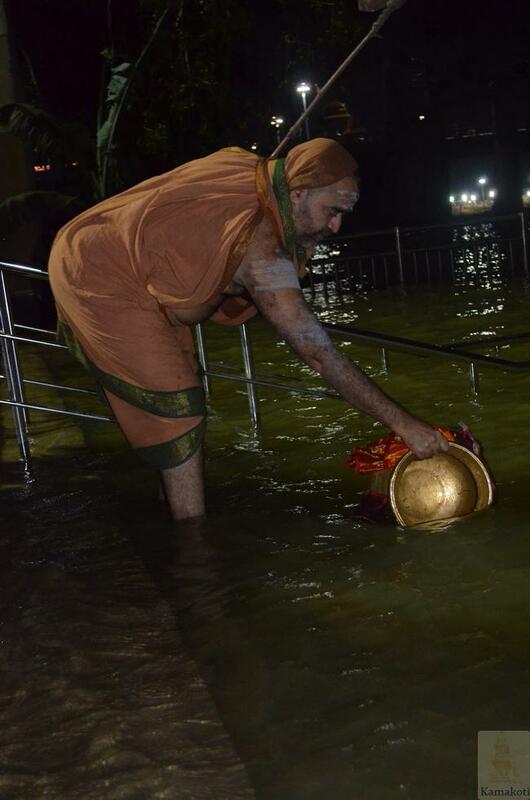 His Holiness observed Anushthana on the banks of the river. 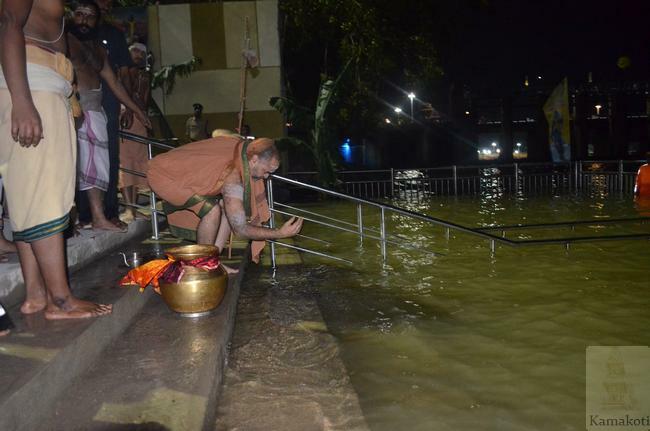 Dasha Dana & Pancha Danas were performed under Ashwattha Tree on the banks of the river. 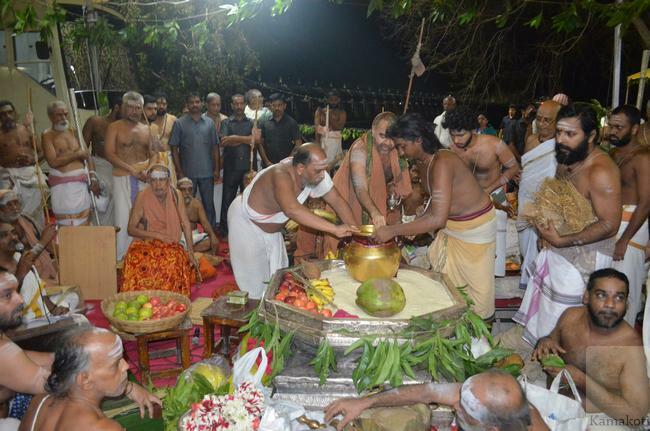 Go danam was given to a Agnihotri Scholar after due performance of Go Puja. A Kapila Cow (Greyish Black in color) was given as it is considered auspicious. 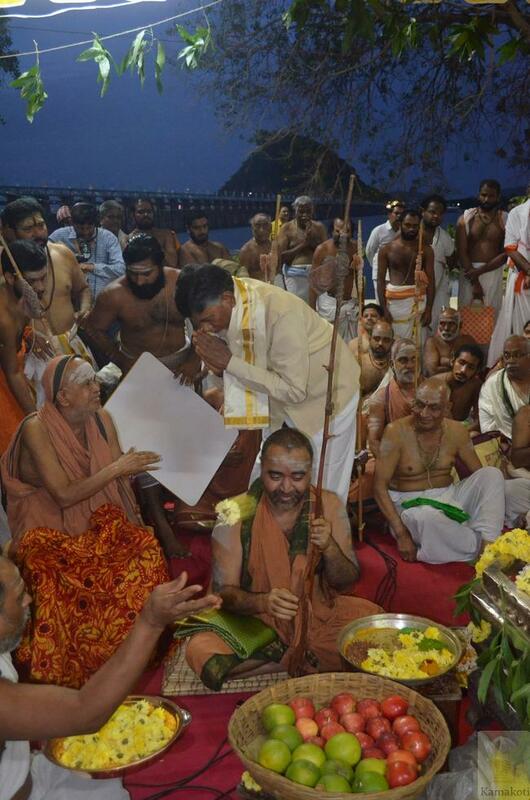 Chief Minister of Andhra Pradesh Shri N Chandrababu Naidu along with his family and Ministers participated in all the Pujas and performed Snana. 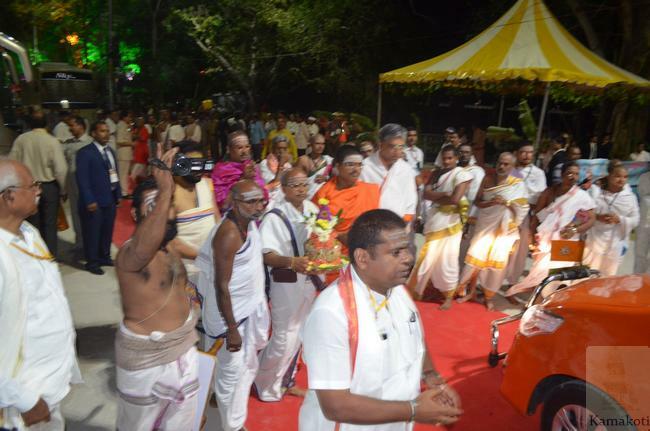 The Chief Minister also performed various danams including Go Danam. Endowments Minister Shri P Manikyala Rao and other officials from Andhra Pradesh Government were present during the occasion. Veda Swasti of Rig, Yajus, Sama & Atharva Vedas & Pancha Shanti mantras were chanted. Sanmana Karyakrama was held for Vedic Scholars with the Chief Minister giving away Vastra & Dakshina in the holy presence of His Holiness. He sought blessings of His Holiness.